In Ephesians 6:21-24, the Apostle Paul comes to the end of his deeply theology, yet wisely practical, letter to the Ephesians. He does so by touching on the main themes of his letter (grace, peace, faith, love) and calling the church – and us – to “love incorruptible”. In Ephesians 6:1-5, we move onto the next set of household relationships: parents and children. These relationships (parents to children; children to parents) are the most dynamic, complicated and influential relationships we have. Here, Paul explains that the primary task of parenting is to cultivate a Jesus-centered home and the primary task of children is to honor their parents. In Ephesians 5:22-33, we have he longest statement on the relationship between husbands and wives in the New Testament. This week, we examine God’s call to every husband to function as the “head” of his wife and family. That “headship” is expressed as the husband takes primary responsibility for sacrificially loving, protecting and providing for his wife – just like Jesus does the church. Holiness is becoming who we really are as we become increasingly like Christ. Following the pattern of transformation laid out in Eph 4:22-24 (put off + be renewed + put on), in Eph 5:1-21 Paul gives some practical insight on what it means to walk with Jesus based upon our identity in Him. Following the pattern of transformation laid out in Eph 4:22-24 (put off + be renewed + put on), in Eph 5:1-21 Paul moves on to additional marks of our new life in Christ by (again) appealing to who we now are in Him with three metaphors: “beloved children” (1-2), “saints” (3) and “children of light” (8). Without renewal we’re left with moralism and behavior modification in the form of putting off/putting on. But, with this renewal, God invites us to a relational and organic process of change, transformation and holiness. 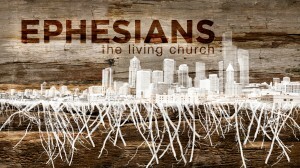 Pastor Adam Sinnett revisits Ephesians 4:17-24.